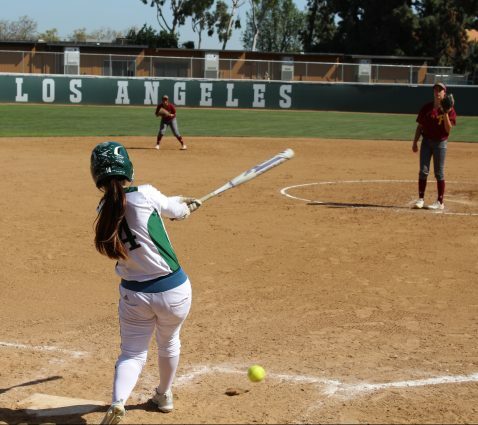 East Los Angeles College softball was dominated by Pasadena City College in a 8-3 loss at home yesterday. After yesterday’s defeat, the Huskies are now 3-4 in the South Coast Conference-North and sit in the fourth spot of the table. PCC began and finished the game with the same intensity that made it difficult for ELAC to get base hits. In the bottom of the fourth inning, sophomore catcher Destiny Avena hit the ball toward right field so that sophomore first baseman Jessica Hernandez can score and cut the lead by two runs. Sophomore designated player Sara Serrano smashed the ball to center field and a miscommunication between PCC outfielders and infielders allowed sophomore right fielder Natalie Acosta to score and cut the lead by one run. The Huskies were down by one run but PCC extended its lead in the top of the sixth inning. Sophomore pinch hitter Jazmine Cabrera came on for freshman right fielder Leilani Montanez. Cabrera hit the ball toward left field so that sophomore center fielder Angel Urbina can run in and score. Unfortunately, Urbina had to be subbed off after she collided with Avena when she slid to home plate. “We didn’t come to play. Our top players didn’t play today and when your normally battling for playoffs, you want your top players to hold their weight. Be big for us and they weren’t big today,” head coach Erika Blanco said. PCC continued to play aggressively as sophomore third baseman Angelica Lopez smashed the ball toward left center field so that Montanez and freshman pinch runner Audrey Sebastian can score. “We made errors and we let it get the best of us instead of coming back and recovering. We just let it set us back,” Sophomore shortstop Angelina Gonzalez said. Gonzalez got a hit, run batted in and strikeout with four at bats. Freshman left fielder Nathalia Velasquez capitalized PCC’s best inning with an RBI single so that Lopez could score the last run of the game. “Before the game I would’ve never thought that we would’ve played this way so it’s hard. But you just try to have them focus on their goal. We came within one (run) but we let it go again so we just didn’t bring it today,” Blanco said. After yesterday’s loss, Blanco said that she isn’t sure if her team is strong enough to make it to playoffs. “Before today I would’ve said that we’d be ready and fired up but after today, I don’t know,” Blanco said. But team leaders like Gonzalez and Manning believe that yesterday’s game was an awakening. “Going into Thursday’s game, I feel really confident about that because now that we got this wake up call, we’re going to be able to come Thursday and win,” Manning said. Manning had four at bats and got zero hits in a game that she described as a slumpy game where the team was too relaxed. The last time ELAC played PCC was on February 20, where the Huskies lost 7-4 at home. The Huskies look to bounce back from their conference loss when they host Mount San Antanio College in another SCC-North game tomorrow at 3 pm.